This is a 3 story farmhouse that has been recently renovated, with the third floor being a self contained apartment. There is a separate entrance for the third floor, and it is also accessible through an inside door on the second floor. There are two bedrooms on the third floor, 4 bedrooms on the second floor, and two bedrooms on the first floor. There are two washers and dryers, one of them a stacking unit, and one of them full sized. The kitchen on the first floor is good sized, and the one on the third floor is smaller, but fully equipped. The third floor also has a dining area, as does the first floor. In total there are 2 full sized bathrooms, and one three quarter bath. We are located next to York's wild Kingdom, and are two to three minutes walk from the beach(Short Sands), and shopping. There is a basketball court right next to Short Sands, and also a big grassy area to play on. There are numerous restaurants, as well as many shops right down town, which you can see from the front yard. There is a big yard at the house that you can play volleyball or other sports on. This is a prime location, as you are very close to the attractions, but it can also be very quiet. 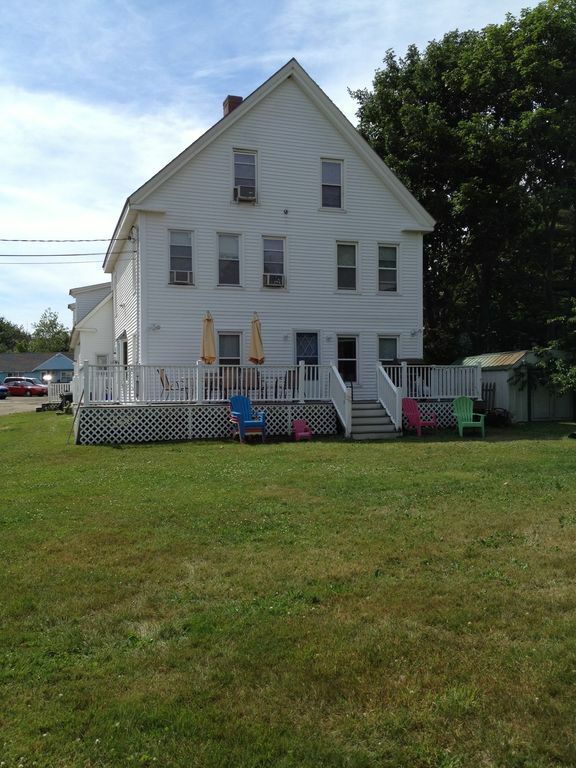 June 15th-June 30th-$2000.00 for the first two floors and $2250.00 for all three floors. July 1st-August 31st-*PRIME WEEKS*$2500.00 for the first two floors and $3000.00 for all three floors. ***The State of Maine has mandated a 7% sales tax on all weekly summer rental, therefore, I will need to add $210.00 to the rental price. Sorry for the inconvenience. Please feel free to contact Jill, with any questions or concerns you may have. Keywords: Large, three story, renovated farmhouse. Top floor is a self-contained apartment. toilet, combination tub/shower, Second floor. toilet, combination tub/shower, Third floor. There is a slight ocean view from the third floor. There are several window units throughout the house. I will provide blankets and pillows, you need to bring your own sheets and towels. You will need sheets for 9 twin beds, 2 full beds(futon bunks), one full size futon, one full size 'click couch' , and two queen beds. (2) Full size washer on the first floor and stackable smaller unit on the third floor. (2) Full size dryer on the first floor and smaller stackable unit on the third floor. Plenty of parking available, and the lawn is safe for vehicles, if necessary. (2) Both are full sized, installed(not portable) dishwashers. (2) Both refrigerators are full sized! One had an ice and water dispenser, and the other does not. (2) Both are full sized, over the stove microwaves. (2) There is a large kitchen on the first floor, and a smaller, but full kitchen on the third floor. We couldn't have asked for better accommodations. This is our 3rd time staying in the farmhouse and it is perfect for our needs. Jill and Harry are always friendly, helpful and provide everything we need. Even our dog can get a great vacation :) . The walk to town and the beaches cannot be beat , and the proximity to the zoo is great for young kids. We would highly recommend this property and cannot wait to come back!! Could not ask for a better location to enjoy York beach and all its attractions. Farmhouse was large and easily accomodated our family of four adult children with their children. Farmhouse has a large lawn that was great for outdoor family activities. Parking was not a problem. Have already booked our 2015 vacation. Thank you so much Bert, we really enjoyed meeting you and your family, and look forward to seeing all of you next year! Excellent location and spotless, spacious accommodations.. Three generations, octogenarian, teenagers to preschool, variable population up to 18. Short walk to beach, town, amusements and Daffodil. Walk to beach is GREAT, especially with a crowd. come and go as you please - no need to pack up & drive, can come back for lunch, more sun screen, your trashy beach book, etc. Cyclists, walkers, runners all just stepped out the door and away Big yard for Frisbee, football, Bocce & dog chasing dog. All reported "One of the best family vacations ever." This was our third at about five year intervals. Jill & Harry great hosts - warm, friendly and responsive. Can you tell we liked it? *Yes, we did have the "Family University" T Shirts. Awwwwww................thank you! We loved having you and your wonderful family here. We hope that you think of us for your next family reunion. Jill and her husband were wonderful. Everything we needed they provided. Will definetly be calling Jill to make reservations for next summer. Great location and yard for the kids to play in. Couldn't have asked for anything more in a vacation rental!!! !